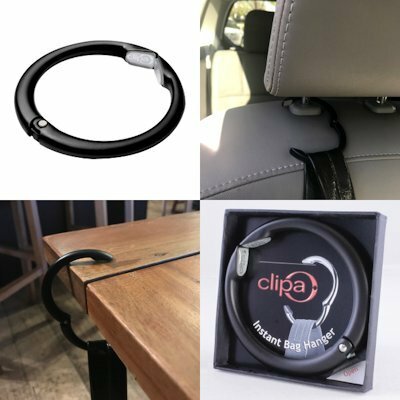 The Clipa goes on your handbag strap and works in seconds to hang your purse from almost anywhere. Its hidden closure system is automatic: simply place on end on table or other surface and hang bag from the other. When finished, simply pull the strap and Clipa slides back onto the bag. The Clipa holds up to 33 lbs. yet weighs just 1.6 oz. and has been tested to withstand the equivalent of 10 years of daily use. Clipa’s circular design and slim profile means it can be used in many more places besides tables, counters and bars. Hangs your bag on bathroom doors, stall walls, shopping carts and car seat headrests. Works on purses, backpacks, shopping bags, diaper bags, jackets, even umbrellas. Use it restaurants, bathrooms, sporting events, theaters, casinos, cruise ships, concerts, playgrounds. Great for shopping and travel. The Clipa also doubles as a bracelet that can be worn alone or mixed with bangles. $15.99 MSRP. Available in several finishes to match the hardware on your purse.